The leader in Maryland HQL and Maryland Wear and Carry training. We offer both firearm and non-fire less than lethal training. High impact training that goes beyond simple firearms training. Our core training is the Wear and Carry and HQL in the state of Maryland. Maryland Wear and Carry and HQL training is the core of Fortress Training's Maryland training. However, as a leader in the mid-atlantic, we offer advanced concealed training for those in other states. Whether range or off-range, we will take you to the next level. The aim of our handgun training is to create an environment that allows you to learn at your own pace. 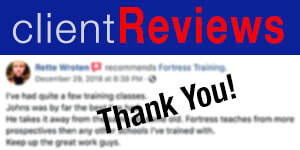 Whether you are interested in tactical level training, or just learning to shoot, our instructors take the time to ensure you achieve your goals. Our training is the most comprehensive and complete in the state of Maryland. It is the next level of concealed carry. The best all inclusive ladies class in the state. We take time to work with you. The most interactive HQL training. We make it simple for you, one stop shop. Learn more.